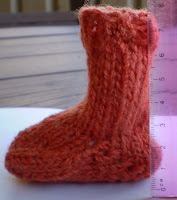 My first article for the workshop was a sock I knitting in the round on straight needles for the sock workshop I tutored last year because double knitting in one colour results in a tube and that, after all, is what a sock is - a tube with a closed end. It began life as a scarf, just like the pattern on Ravelry. But it soon became obvious that this knit, in 5ply acrylic, was too firm to be a scarf. And it was way too slow to knit a scarf in thin yarn in this technique - so what you see will shortly become GS#1's first knitted bib. 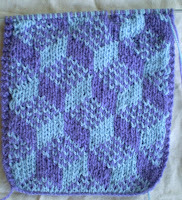 Thanks to Laurita who is encouraging me to knit a bib from her scarf pattern. 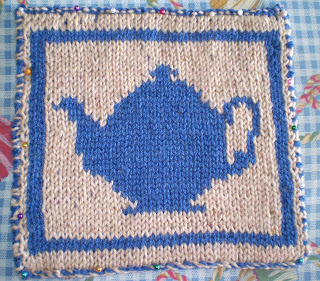 Wanting to show an article that would be interesting enough for the participants to want to know how it was done, I knitted this pot holder / heat pad. 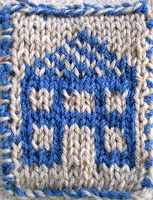 The pattern can be found on Ravelry. Then it was time to design an article of my own for the workshop and write up the pattern. Here it is. 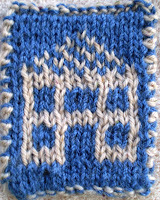 Next time I would make it four inches wider but it is just big enough to be used as a coaster and if knitted in thinner yarns and repeating the motif it could be a bookmark. I had many nice comments about the workshop and people were amazed that something that looks so complicated could actually be so easy. Thanks to all the participants and to Merrin, our group convenor and Vicki, the workshop coordinator, for continuing to have faith in me and allowing me the joy of tutoring in a hobby I love. I have a few knitting questions I wanted to ask.